I have great news! All of you out there who are worried about another economic downturn can rest easy. Janet Yellen said there’s no reason to worry about another financial crisis, so it must be true. If only it were that easy! I guess we can all stop worrying. Another financial crisis is “not likely” according to Janet Yellen. I understand what she is trying to say, but what a strange way to convey the message. Yes, banks are stronger and we have hopefully learned some lessons since our last economic meltdown, but I can tell you one thing — Steve and I have NOT forgotten. Every investment we make here at Hughes Private Capital has been agonizingly tested and scrutinized to determine how it would react in another downturn — or worse, a meltdown. Fed Chair Janet Yellen said the banking system is “very much stronger” due to Fed supervision and higher capital levels. Fed Chair Janet Yellen said Tuesday that banks are “very much stronger” and another financial crisis is unlikely anytime soon. Speaking during an exchange in London with British Academy President Lord Nicholas Stern, the central bank chief said the Fed has learned lessons from the financial crisis and has brought stability to the banking system. Banks last week passed the first round of the Fed’s stress tests to see how they would perform under adverse conditions like a 10 percent unemployment rate and turbulence in commercial real estate and corporate debt. She also made a bold prediction: that another financial crisis the likes of the one that exploded in 2008 was not likely “in our lifetime.” The crisis, which erupted in September 2008 with the implosion of Lehman Brothers but had been stewing for years, would have been “worse than the Great Depression” without the Fed’s intervention, Yellen said. Yellen added that the Fed learned lessons from the financial crisis and is being more vigilant to find risks to the system. Broadly speaking, the financial crisis was caused by excessive risk taking in the mortgage industry as banks made loans to less-desirable buyers and then packaged them into securities that were sold on Wall Street. Yellen’s predecessor, Ben Bernanke, once famously called problems in the subprime mortgage market “contained,” a statement that would be proven wrong when the collapse of illiquid mortgage-backed securities cascaded through Wall Street and contributed to the worst economic downturn since the Great Depression. 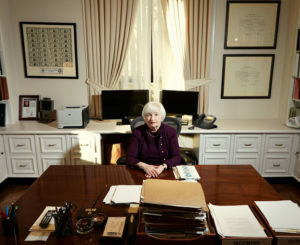 Yellen said the Fed has learned lessons over the years, not merely since the financial crisis but through much of the late 20th and early 21st centuries about risk and the Fed’s need to be vigilant against more permissive economic and monetary policies that prevailed. “After the financial crisis, those who see the damage in that type of thinking have played a major role in ensuring that we have a more appropriate system of supervision and regulation, hopefully for a good long time,” she said.